I just love it when long standing mysteries in virology are suddenly solved, typically by the use of new technologies. 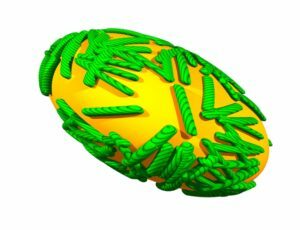 In this story, the long standing mystery was why poxvirus mRNAs have a stretch of poly(A) in their 5′-noncoding regions. The answer is that it allows the ribosome to preferentially translate these viral mRNAs over those of the host (link to paper). Ribosomes, the sites of protein synthesis, are very large assemblies of RNAs and proteins. A ribosome-associated protein called RACK1 is the major player in this story. This protein was previously found to be important for translation of viral RNAs by internal ribosome entry, a process in which ribosomes bypass the 5′-cap structure on mRNAs. Cells lacking the gene encoding RACK1 seem to be just fine – they grow normally. This result would suggest that RACK1 is not needed for translation of mRNAs via the 5′-cap structure. But the translation of mRNAs of vaccinia virus, a poxvirus, is blocked in cells lacking RACK1. More specifically, the viral mRNAs produced later in infection cannot be translated. This effect of RACK1 on vaccinia virus mRNA translation prompted a closer look at the protein in virus infected cells – which revealed that it is phosphorylated by a viral protein kinase. Phosphorylation of RACK1 makes the ribosomes preferentially translate vaccina virus mRNAs – an effect that is completely dependent upon the poly(A) in the 5′-untranslated region! Transfer of this poly(A) sequence to a non-viral mRNA enhanced its translation in cells in which RACK1 is phosphorylated. The amino acid sequence of RACK1 that is phosphorylated is within a loop that contacts the 18S ribosomal RNA subunit. An examination of RACK1 proteins from different species reveals that in plants, unlike in mammals, this loop contains a stretch of negatively charged amino acids. Because a phosphate is negatively charged, it made perfect sense to see if the plant loop sequence, when transferred to mammalian RACK1, could stimulate translation of poly(A) containing mRNAs. It did! In other words, phosphorylation by a vaccinia virus protein kinase makes RACK1 plant-like! Which is why the authors called their paper ‘Trans-kingdom mimicry underlies ribosome customization by a poxvirus kinase”. Exactly what RACK1 protein is doing in plants is a burning question, as is how RACK1 recognizes mRNAs containing a poly(A) leader. Phosphorylation of RACK1 by the vaccinia virus kinase explains why viral mRNAs with poly(A) leader sequences are preferentially translated in infected cells (late viral mRNAs have this unusual leader). The presence of poly(A) in the 5′-ends of late vaccinia virus mRNAs is considered to be a consequence of polymerase slippage – but it is clearly not a mistake. At one time, long ago, a polymerase might have slipped for the first time, but the resulting poly(A) in the mRNA conveyed a selective advantage that remained. Today I would no longer call the addition of poly(A) to vaccinia virus mRNAs an error! Why did it take so long to figure out the role of poly(A) at the 5’-end of vaccinia virus mRNAs? The right technology was not available – the key ones were the ability to knock out specific genes in cells, to knock down mRNA levels with RNA interference, and to identify the sites of RACK1 phosphorylation by mass spectrometry. These are not only recently developed techniques, but they have become widely accessible. But don’t forget the use of long-ago isolated vaccinia virus mutants of the protein kinase that were an essential part of this story. Rich Condit, a poxvirologist, joined Nels Elde (also a poxvirologist, though he dabbles in other systems) and me to discuss this very cool paper on episode #21 of TWiEVO, This Week in Evolution. Rich had some very good insight on this paper; plus he bristled twice during the episode. You’ll have to listen to find out why.